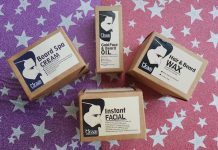 Everyuth has re-launched its range of skin care products with a brand new packaging. Today I’m going to review one of its re-launched product, Everyuth Golden Glow Peel-Off Mask with Nano Gold Peptide & Minerals. Most of us have already used orange & golden glow peel-off masks from Everyuth Naturals, and this peel-off mask is the improved version of the older one. I’m a big fan of peel-off masks as they are more hygienic to use, time saving and it’s really a fun to peel-off these masks. Packaging : It comes in an opaque blue color squeeze tube with blue screw cap. 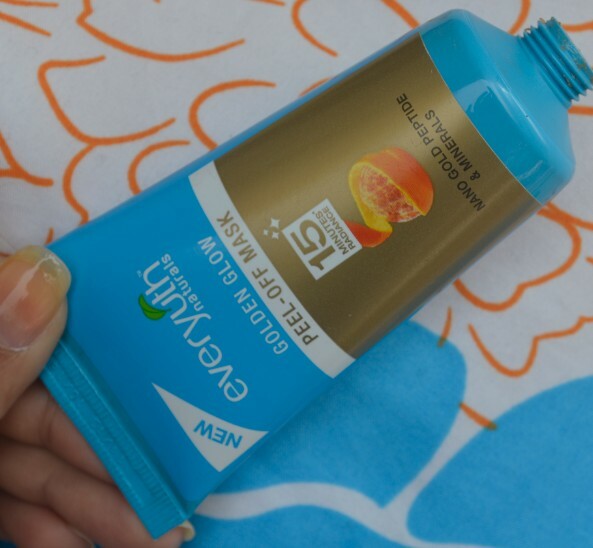 My Experience : I’ve been using Everyuth Golden Glow peel-off mask since I was in college and it is my most favorite one, when it comes to face masks. These days it comes in an attractive packaging, but I haven’t seen much difference in the face mask. It has a sun set yellow color and has a strong orangey fragrance which I like the most. 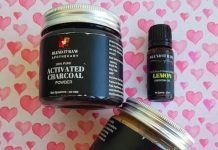 It has a bit runny consistency, but it spreads very easily onto the skin. You will also notice tiny golden glitter particles in it. 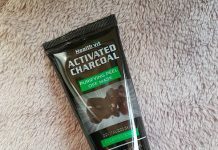 I use this mask once in a week and after every use it gives me excellent results. Last week I had to attend a family function in Mumbai and I didn’t get the time to go to the parlor, as we arrived the same day of the function. But thankfully I had this mask with me, so I just cleaned my face with my favorite face wash and then I exfoliate my skin and the final step was applying this mask. I applied this mask evenly on my face & neck avoiding the eye area. While applying this mask, make sure you should not apply it either very thick or thin, as the thicker layer will get more time to get dry and thinner layer is very difficult to peel off. After 15 minutes, I peeled off this mask started from a forehead all the way down towards the neck. 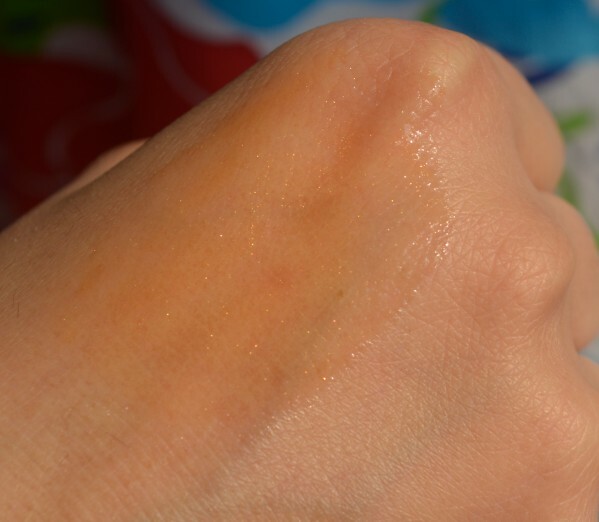 It gave the instant glow to my skin that lasted for the whole day. Make sure you do not apply this mask on facial hair, as it becomes very painful to peel it off. It gives a cooling sensation to skin and might sting a little bit if you have sensitive skin or rashes. I’m not saying that it gives better results than parlor facials but when you are in a hurry and don’t have much time to go to the salon, this mask is a savior for you. Use of this mask at least once in a week gives a nice glow to your skin. It’s sturdy and convenient to use packaging makes it a must have product while traveling. This is really an amazing product at such a low price. I’m looking forward to use other Everyuth peel-off mask variants soon. 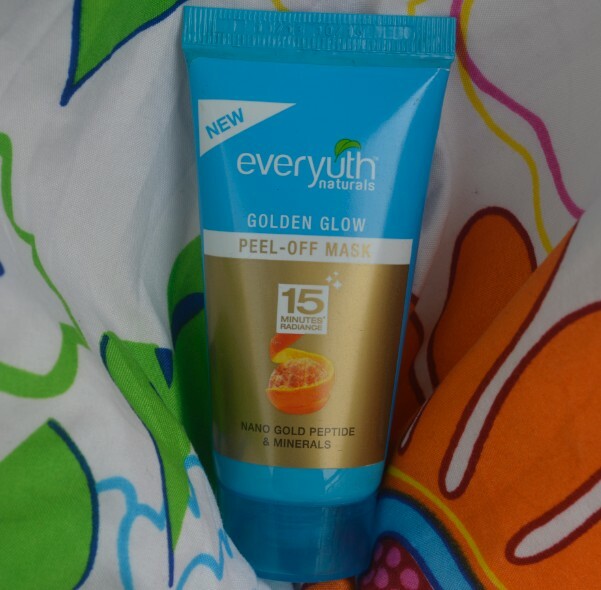 Everyuth Golden Glow Peel-Off Mask Price in India : Rs.75 for 50g. Claim : Dust, dirt and pollution, clog skin pores and make the skin look dull and dark. New advanced Everyuth naturals golden glow peel-off mask is a home facial with Nano Gold Peptide and Minerals that works wonders on your skin. It peels away dead cells, dirt and bacteria from within from the skin pores, stimulates blood circulation and oxygen supply. In just 15 minutes, it gives you an instant fairness with a golden glow. Usage : Wash your face, pat skin dry. Apply even layer over your face avoiding delicate areas like eyes and mouth. 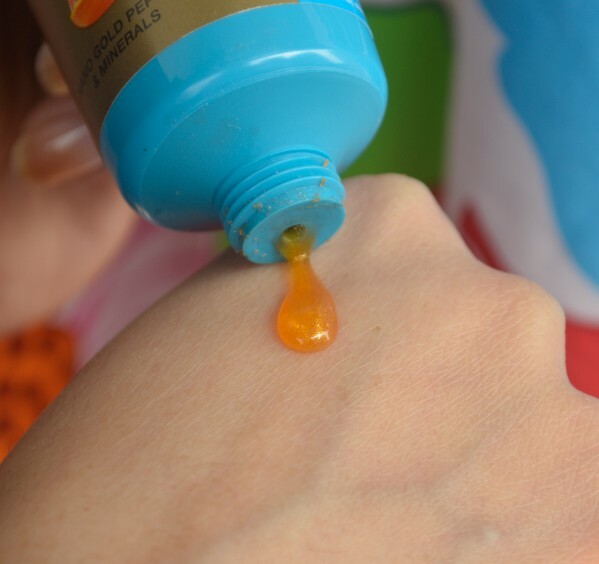 Do not apply very thin layer, as it will not peel-off evenly. Let it dry for 15 minutes. Peel-off from forehead in a downwards direction towards chin. Wash off if required. Use at-least twice a week to get the best results. Ingredients : Water, Alcohol, Polyvinyl Alcohol, Polyvinyl Alcohol, Polyethylene Glycol, Orange Peel Extract, Methyl Paraben, Fragrance, Colloidal Gold, Color Sunset Yellow, Lactic Acid.